Teas are prepared from the leaves of an evergreen shrub which is grown very extensively in China and Japan. 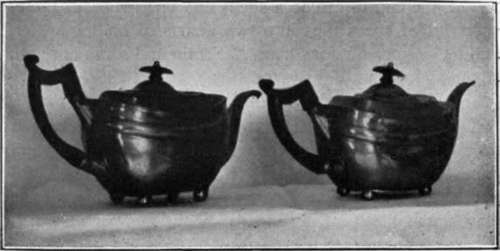 Teas are divided into two classes, - black teas and green teas. They take their names from the color of the leaves, and the color depends upon the manner in which the leaves are cured. "The method of preparing tea differs in different countries in which this commodity is grown. In India, the manufacturing processes are very much simplified, and the greatest portion, if not all of the work is accomplished by machinery; thus the leaves only come in contact with the hands of the laborers in picking." "The method of manufacture of black teas in Japan is essentially as follows: The leaves are withered by exposure to the sun, fire being used only in cloudy or rainy weather. An hour's sunning is usually sufficient. After withering, the leaves are rolled and twisted. Black teas are usually rolled in an apparatus made especially for this purpose. The rolled leaves are now subjected to fermentation. This is a very important operation, since its influence -on the quality of the tea is considerable. During this operation the leaves lose their disagreeable raw odor, and acquire a fine flavor and the desired tint. One method of fermenting the leaves is to make them up into small balls, which are placed in shallow bamboo trays, covered with a white cloth, and set aside in a sunny place. A second method is to spread the leaves in a tray, press them together, cover, and place them in a sunny place, as above. The progress of fermentation is determined by the appearance of the leaves; the full time required being about one hour. After fermentation, the leaves are exposed to the sun in a thin layer. During this sunning the green color of the leaves gradually changes to black. "The next process is the 'firing.' The leaves are placed in a tray over a charcoal fire, and the temperature gradually increased as the moisture is driven off. The leaves are constantly turned, to insure uniform drying. The leaves are transferred to another tray, carefully mixed, and the drying repeated until they are dry. The final operation consists in passing the leaves through sieves of different meshes, and packing. The tea is divided into three classes, depending upon the size of the leaves, viz., Pekoe (the leaf bud), Souchong and Bohea. "As already stated, these manipulations are very much simplified in India. According to Col. Money, the operations practiced in the older tea countries have been reduced from twelve to five. Green teas are prepared by first steaming, then rolling, slowly drying, sorting by sieves, then facing. Japanese teas are prepared under better sanitary conditions than Chinese teas. To Make Tea. To make green tea, heat the teapot with boiling water. Pour the water out, put the tea in (one teaspoonful to each cup) and pour on enough fresh-boiled water to thoroughly saturate it. Set the pot back on the stove where it will keep hot, but not boil, and let the tea steep from five to ten minutes, then pour on the quantity of hot water needed, and serve; or pour water all on at once, and let steep. To make black or Oolong tea, use two teaspoonfuls to each pint of water, and proceed same as in making green tea. Ceylon or English breakfast teas are better steeped at table, as they deteriorate in flavor by standing. Only freshly-boiled water should be used in making tea, as the gases present in water give a pleasant odor, and boiling drives them off. *U. S. Dept. of Agr., Division of Chemistry, Bul. 13, pt. 7. References: Chambers' Enc. p. 114; Enc. Brit., "Tea," "Coffee;" Johnston's Enc, "Tea," "Coffee," and "Chocolate," pp. 50, 376, 377; Buckeye Cook Book, pp. 204-207; Parloa's Kitchen Companion, pp. 818, 819, 822-824; Art of Cookery - Ewing - pp. 77, 78; Art of Cooking for Invalids - Jack - pp. 151, 152.